Upper Valley Connections: Santa "Stops"
Santa is busy making his rounds throughout the Upper Valley...if you're hoping to find him, we've got most of his itinerary for the next week right here! Complete details on all of these events can be found on our website. The Lebanon Parks and Recreation Department is sponsoring a call from Santa, through their "North Pole Calling" event on December 15th. 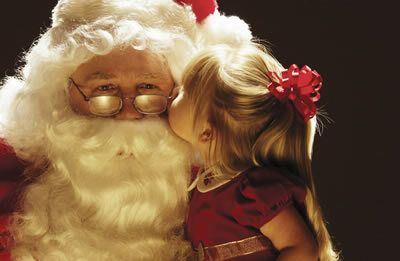 Capture the magic with a call from Jolly Old St. Nick himself! Details can be found on Lebanon Parks and Recreation site. Take a ride on The Polar Express! The White River Flyer will be transformed into The Polar Express on December 11th & 12th, Santa will be there too of course! For information and tickets, visit the Hartford Chamber of Commerce website. There are only 3 days left to enter our Anniversary Celebration Giveaway Contest. Visit our website to enter and for a list of fantastic prizes, and to double your chances of winning become a fan of our Facebook page. Drawings begin on December 6th! And don't forget, our partner site for the Arts is also hosting a Holiday Contest. Drawings begin on December 6th as well. Visit their website to enter and view a list of prizes; become a fan of their Facebook page to double your chances of winning.